Guilin, locates on the southwest of China, is a small but one of the best of best cities you should not miss when taking a tour to China. A cruise along the Li River between the tall pointed hills, so familiar from Chinese painting, is the highlight of all tours concerning about Guilin. Guilin is world-famous for its serene landscape, Karst limestone formations, mist-covered hills and bamboo groves. It is home to more than ten ethnic groups, including Han, Zhuang, Miao, Yao, Hui and Dong. On the way from the airport to your hotel, you will see dozens of pretty hills everywhere in the city of Guilin. It is a city of hills and green trees and boasts one of the most photographed areas of China. 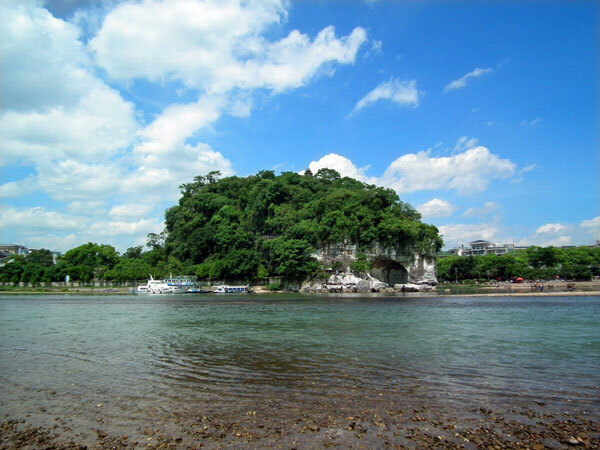 Today, enjoy your relaxing city tour covering the Elephant Trunk Hill and Reed Flute Cave, the symbol of Guilin City. Then have a stroll in Seven Stars Park which is local's favorite place to relax and refresh. The Rice Noodle Banquet will be a good choice as an optional dinner if you wanna have a try. Elephant Trunk Hill, or Xiangbishan, is the symbol of Guilin. Observed from a distance, you'll see an elephant-like form standing majestically at the confluence of the Li and Yang Rivers, with its trunk arching into the clear waters, a fantasy elephant eternally quenching a gargantuan thirst; lifelike in shape and energetic in posture. Reed Flute Cave is named for the special reeds, used for making flute instruments that grow near the cave entrance. The caves are a feast for the eyes. The natural beauty of a profusion of stalactites and stalagmites, stele, stone pillars, stone curtains and stone flowers creating an infinite variety of extraordinary scenes, creatively illuminated, is bound to evoke gasps of admiration. It is fitting then, that Reed Flute Cave is commonly praised as Nature Grand Art Palace. Seven Star Park is another good example of Karst features. The park takes its name from Seven Star Hill which consists of seven peaks, whose layout allegedly resembles the constellation of Ursa Major. Flower Bridge, a 5-arch bridge at the entry to the park, is famous for its elegant style. It was originally built in the Song Dynasty and rebuilt in 1965. Viewed from the side, the arches and their reflections always create a full circle, and varying water levels appear to have no effect. The park is home to fascinating caves adorned with thousand-year-old cultural graffiti, calligraphy and inscriptions carved into the rocks by ancient poets and artists. There is a small zoo have 3 cute Giant Pandas! Guilin Rice Noodle is the most popular snack in Guilin. If you want to know Guilin culture deeply, it is a recommended choice for you to taste the Banquet of Rice Noodle as your optional dinner. The thing that sets one dish apart from another is the soup, which is made of pork, steak, Lo Han Kuo, and other seasonings. Depending on different kinds of ingredients used in the soup, rice noodles can be divided into vegetable, three-fresh, original soup, spicy and sour, beef, and horse meat ones. In the morning, be driven to Pier for your Li River Cruise. A double-decker river boat is waiting for you. The landscape from Guilin to Yangshuo is truly a masterpiece of nature. The crystal waters, straight-out-of-a-painting mountains, peaceful farm fields, hard-working-but- ever-smiling fishermen and wandering water buffaloes inspire poetic musings of Guilin’s charming life. Under the blue sky, your river boat transports you in an unending daydream. Some guests may also hear about the night show- Impressions of Liu Sanjie performance. The site is only one mile from West Street in the world’s largest natural theatre which utilizes the waters of the Li River as its stage, flanked by twelve mist shrouded hills and the heavens as its backdrop. Mist, rain, moonlight, the hills and their inverted reflections in the river all become the ever-changing natural background, so you will enjoy a unique experience each time you attend. In the 'Impressions of Liu Sanjie', you will be presented with stylized scenes and events from the daily life of the Zhuang people living around the Li River. From these pageants, you will gain a realistic sense of Sanjie's birthplace and appreciate the beauty of the folk songs. If you are able to take photographs under low-light conditions, you are assured of some stunning images from this performance. Cooking Day! To get perforation for today’s lunch, you should get up earlier to catch the early local market and buy some food needed. It will be a good chance to get a close contact with local folks. After a bargain, let’s take the trophies to the cooking school and get ready for your cooking lesson. It will be a pleasant experience to learn how to cook Chinese food. After lunch and take a short rest, how about have an excursion (if you are interested, can have a biking) in the countryside of Yangshuo to admire some of the most stunning scenery like the Moon Hill and the Big Banyan Tree. From Yangshuo, it is a short, pleasant drive to the aptly named Moon Hill, a great limestone peak with a naturally created moon-shaped cavern passing through just below its summit. If you get up to the top, you will find the landscape is stunning viewed from the very top; the skyline is lined with peaks of almost equal height – resembling a jumble of giant rock traffic-cones pointing skywards. Be transferred to the airport for your flight to next destination. Due to the uncertainties of the tour, such as special conditions locally, the changes of accommodation rate and etc, the tour should be tailor-made and its price is on request. Please tell us in advance your group information inclusive of departure date, number of pax, and other individual needs, which will be helpful to work out a fit program and the right price. Sorry,have not any similar itineraries.